OMG, my macaroons are internet famous! 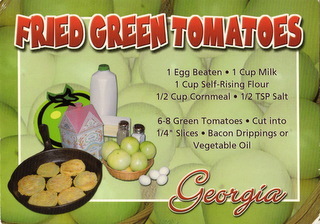 Read the recipe shared by the fabulous food writer Jackie Varriano in her column on PoorTasteMag.com. These are great treats for anyone in your life who can’t have dairy. 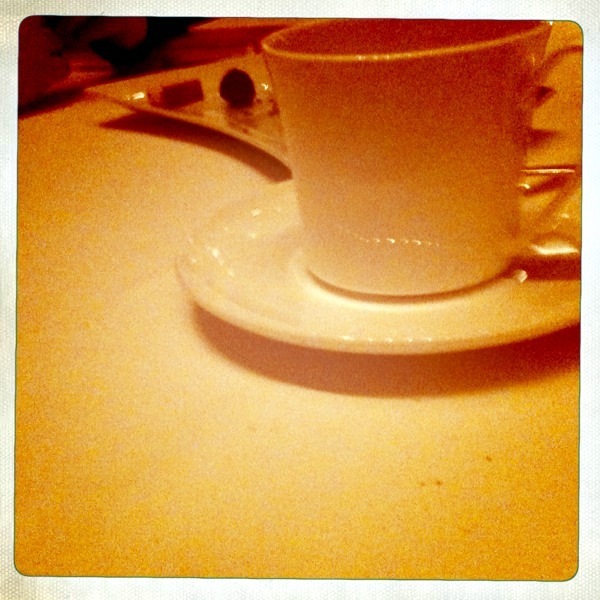 I ate salad, seared ahi, scallops, clams, steak, brussel sprouts, creamed spinach, goat cheese mac-n-cheese, french fries, truffles, coconut ice cream, candied walnuts, and three fruity sorbets… and all I brought home was this lousy photo of my coffee mug. I’m a lucky gal. My friend Jackie, of See Jack Write, came in town from Oregon on assignment for Gayot. Her task: 3 nights, 3 ultra-amazing meals. I accompanied her on night #1: Charlie Palmer Steak in Reno. Unfortunately for dear Jackie on our ride home, I completely overestimated my stomach’s ability. All that richness combined with car-sickness made me one lousy, drowsy, and nauseous co-pilot. Note to self: never gorge again. Or better yet, learn to hang with the foodies! 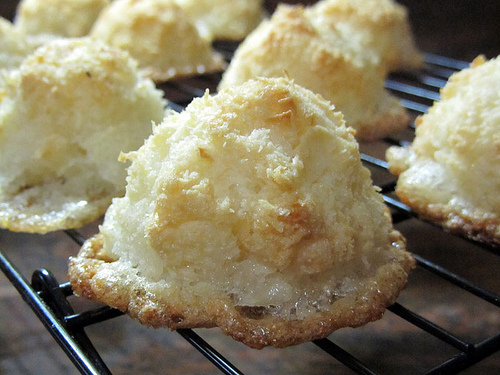 A “grandma’s house” tradition, these flaky golden biscuits are perfect topped with butter and honey. She’d often have honey fresh from a local farmer. Mix ingredients and turn out on a lightly floured board. Roll or flatten, then use cookie cutters (I love my hand-shaped cutter) or get creative by molding the dough into something special (I usually make a dinosaur with each batch). 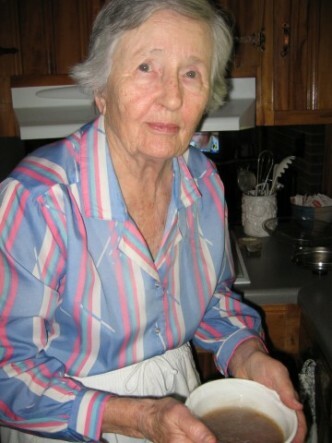 Bake @ 425° for 10–12 minutes. While most folks have banana bread, it was always zucchinis that made it to Daisy’s oven—probably because lots of locals grow squash around Braselton. We always toasted any leftovers, and added butter of course. Lightly beat eggs in bowl, then stir in oil, sugar, zucchini and vanilla. Combine dry ingredients in separate bowl, then stir into egg mixture until well blended. Add raisins and nuts. Bake in greased bread pans @ 375° for 1–1.25 hours. my creations, pre-shower. in-action pics to come. 1) Tasty libations. Not only was there a keg of beer and a DIY cocktail bar (with organic lemonade and limeade), there were creative concoctions like iced green tea and lemonade (my new favorite drink). 2) A thoughtful menu. Grilled pork sandwiches were complimented by melon salad and roasted potatoes, and homemade vegan veggie burgers were yummy leaf-eater options. The caramel-colored bbq sauce topped it all off with a big fat YUM; I guessed it’s secret ingredient to be mustard, yet it was ranch—is there anything that dressing can’t do? Dinner was served with beautifully shaped bottles of rosé. 3) Coed. Males and females gathered alike to toast the unborn. Party lasted late into the night as the father-to-be took the celebration to levels that no impregnated lady would do. 4) Bonfire. Fire pits are the best… especially on cool Tahoe nights. 5) Monkeys. (or any other fun theme to decorate with abandon) This was my favorite part because I had a hand in it, thus a little swell of pride to see my handicrafts in action. 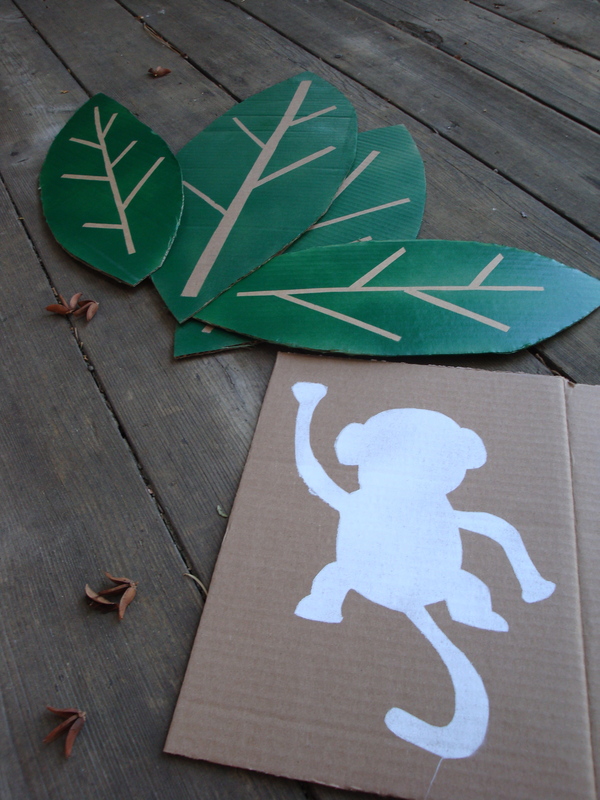 Using some old packing material (from my popsicle mold shipment) as a canvas, I stenciled monkeys galore, and a BABY = ♥ sign. Then I crafted a tree on an umbrella in their yard, stenciling the leaves and making bark and coconuts from the package’s padding. Monkeys were clothespin-clipped on a line already adorned by the host. 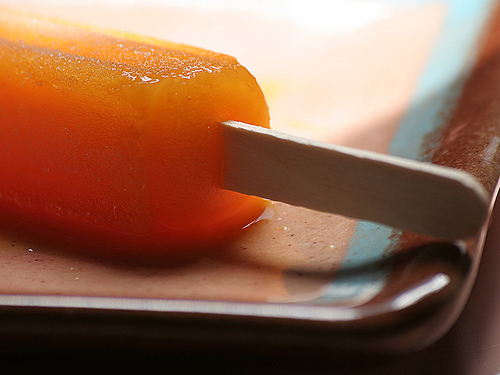 popsicles… perhaps the best thing invented for summertime snacking. I am super excited because a popsicle mold is en route to my address! I am now accepting recipes (via comment) to attempt in my new gadget… come on people, get creative! I will share my batches with each and every one of you (disclaimer: you must live within non-melting distance from my house, or be available to come and get one yourself). Crackerjacks, Big League Chew and hot dogs, move over. There’s a new baseball treat headed for the Reno Aces turf: Tahoe Creamery ice cream. The folks who churned us Tahoe Flow Cookie Dough and Tahoe Trip Mint Chip now want to scoop out an Aces-specific flavor, and have narrowed it down to three options of which they’ll offer tastings at this Sunday’s game (May 24): 1) Batter Up, a cake-batter ice cream with a chocolate buttercream fudge ripple 2) Aces Acai, an acai berry ice cream 3) Rally Red Malted Cherry, a cherry ice cream with dark cherries and a malted accent. Though I have yet to taste, my preliminary vote goes to Batter Up—I’m all for old-fashioned decadence, and puns.